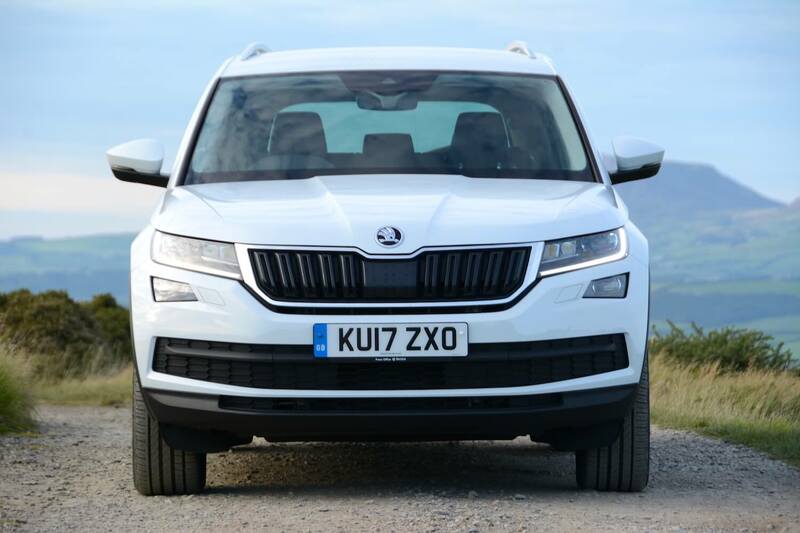 The Skoda Kodiaq represents good value for money if you’re looking for an efficient seven-seater 4×4. 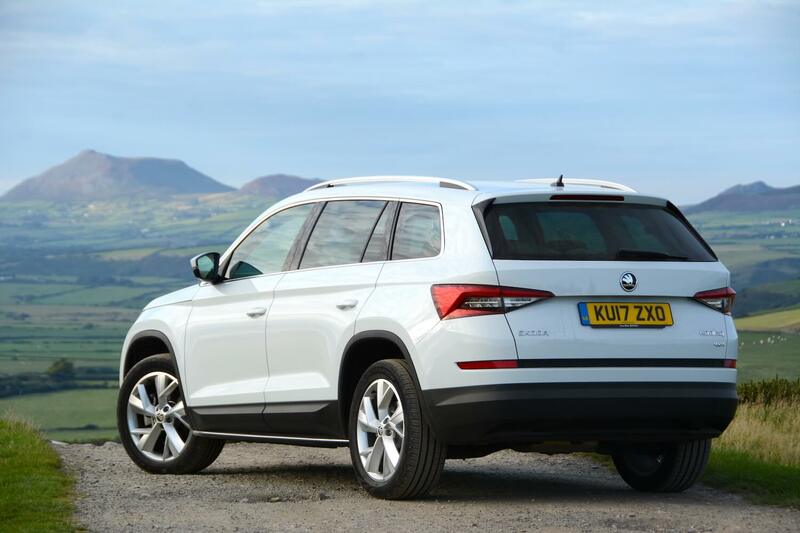 Skoda has been best known over recent years for offering good value saloons, estates and hatchbacks. However everyone now wants an SUV rather than a saloon, so enter the Kodiaq, available as a five or seven seater, with two or four-wheel drive, and with a range of petrol or diesel engines. The Skoda Kodiaq is based on Volkswagen Group’s modular MQB platform, shared with the latest Volkswagen Tiguan and the SEAT Ateca, although the Kodiaq is longer than the Tiguan. 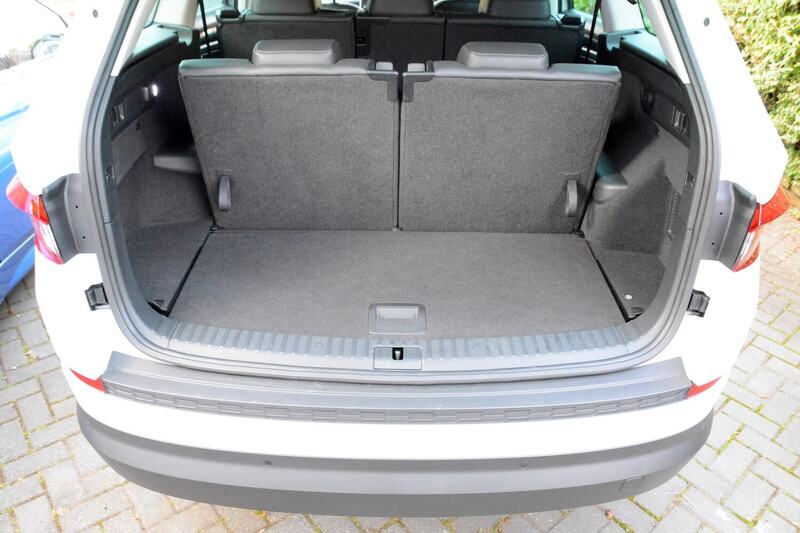 This means that the Kodiaq either has five seats and a huge boot, or it can accommodate seven people, and still have some luggage capacity. Our test car had a 150PS 2.0 TDI engine, with a seven-speed DSG transmission, and four-wheel drive. The interior is one of the best Skoda interiors yet, and we could live with the exterior (helped visually by the large 19-inch alloy wheels), although in our view the angular shapes of the front fog lights don’t sit happily with the rest of the front of the car, spoiling the mostly uncluttered exterior styling. It was easy to get a decent driving position in our test car thanks to the electric seat adjustment. Once underway you’re aware that all of the major controls, including the steering, are well-weighted. The Kodiaq is mostly a quiet and refined place to be, particularly if you spend lots of time on the motorway. If you venture off the motorway then you’ll be able to play with the car’s six driving modes. 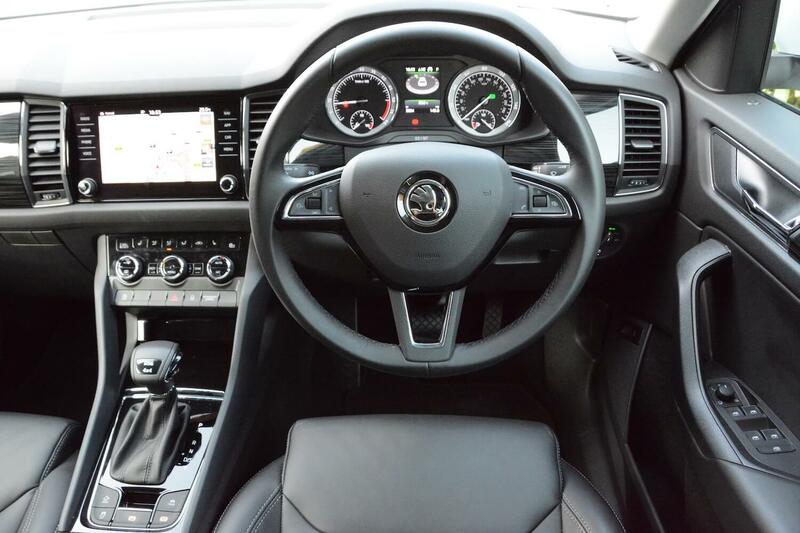 Our test car was fitted with Dynamic Chassis Control, a £980 option, and this resulted in there being a very noticeable difference between the Comfort, Normal and Sport modes. 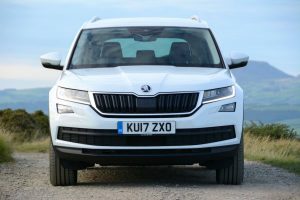 Comfort certainly delivers a comfortable ride, but this does mean that the Kodiaq is a little too soft if pressing on through a series of corners. Sport gives you good body control, but you need to be driving on extremely smooth roads, as the ride is very firm. This leaves Normal as the best default day-to-day setting. The seven-speed DSG gearbox generally works well. It has D and S settings, but compared to the variations in ride, there’s not much difference between the two options. The 150PS 2.0 TDI engine performed adequately under most conditions, but it can sound strained when, for example, accelerating up hills. 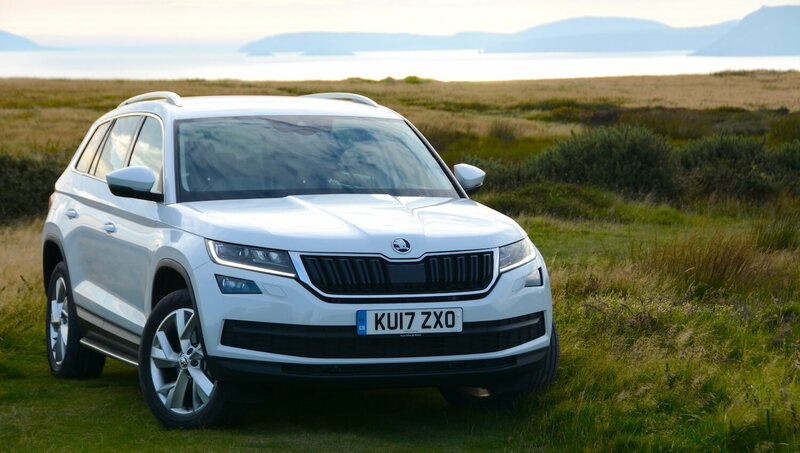 The Kodiaq’s four-wheel drive system provides welcome levels of grip, helping to avoid the front wheels scrabbling in slippery conditions. There’s a large infomedia screen, which mostly works well, but it shares a very shiny, slippery surface with other Volkswagen Group cars, which isn’t helpful when you’re trying to land your finger on small buttons when driving. 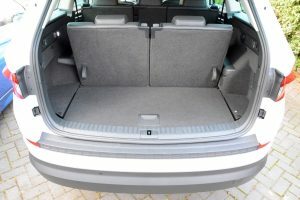 Unlike some rivals, there’s no reversing camera – something which is always helpful in large SUVs that are likely to be used for the school run. The official combined NEDC economy figure for the Skoda Kodiaq Edition 2.0 TDI 150PS 4×4 DSG is 49.6mpg (equating to 149g/km CO2 emissions). This is respectable for a large seven-seater 4×4, but how did it perform in real-life? 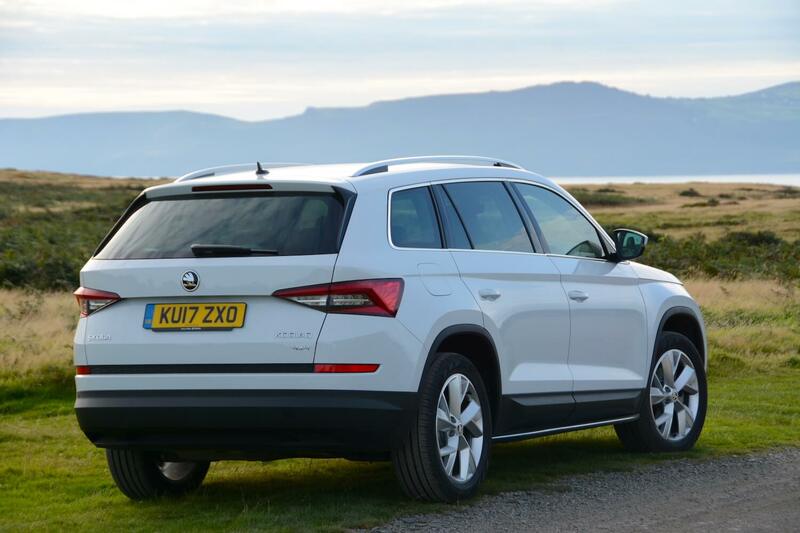 Overall, after a week of mixed driving, but with around 80% comprised of long journeys, the Kodiaq averaged 41.3mpg. It returned 45.5mpg at motorway speeds. We’d say this is a good result for such a vehicle. You also get a useful real-life driving range of between 400-500 miles. 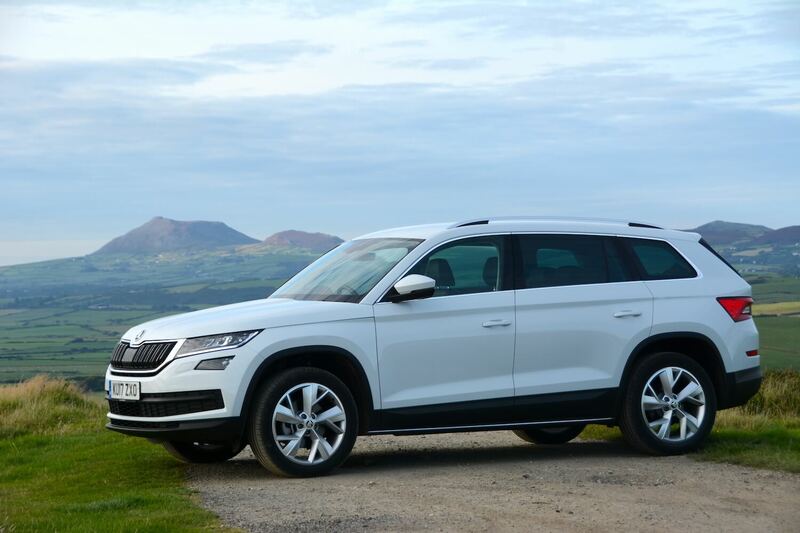 Our Skoda Kodiaq Edition 2.0 TDI 150PS 4×4 DSG test car cost £34,200. It had options of Dynamic Chassis Control (£980), space saver spare wheel (£100) and textile floor mat set (£80), taking the total price to £35,360. 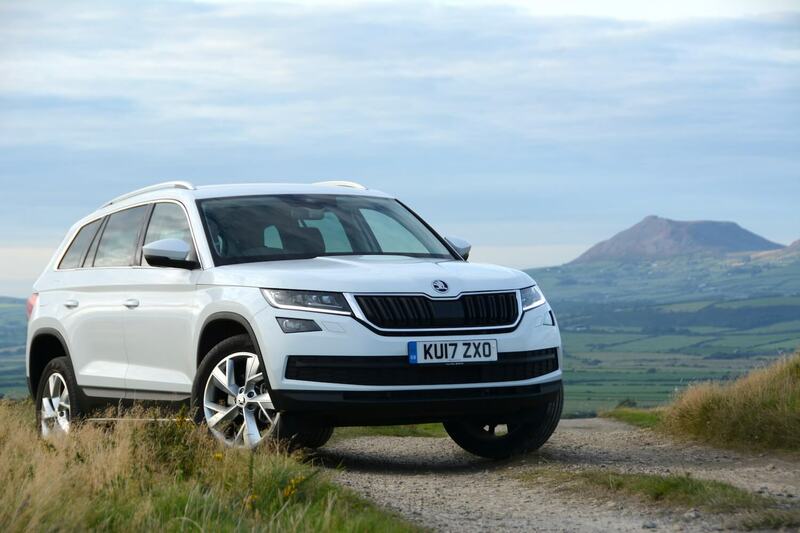 There’s a wide range of Kodiaq models to choose from. 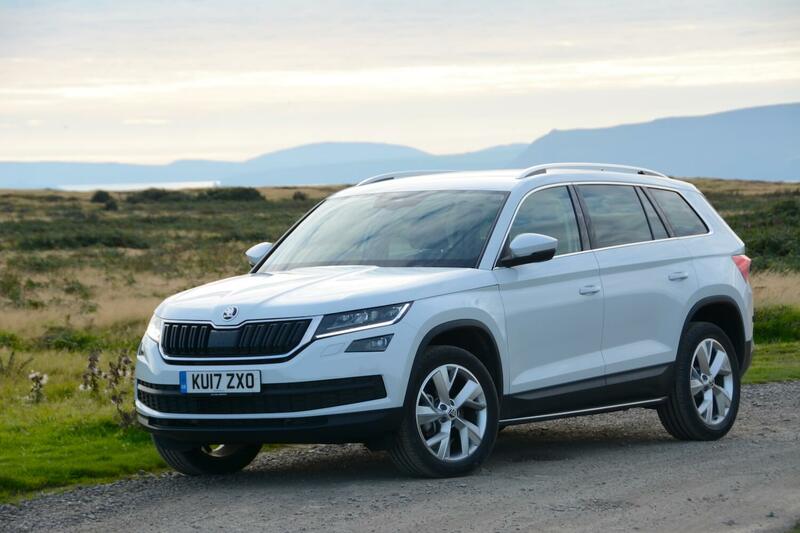 Prices start at £22,190 for the Skoda Kodiaq S 1.4 TSI 125 PS with five seats. 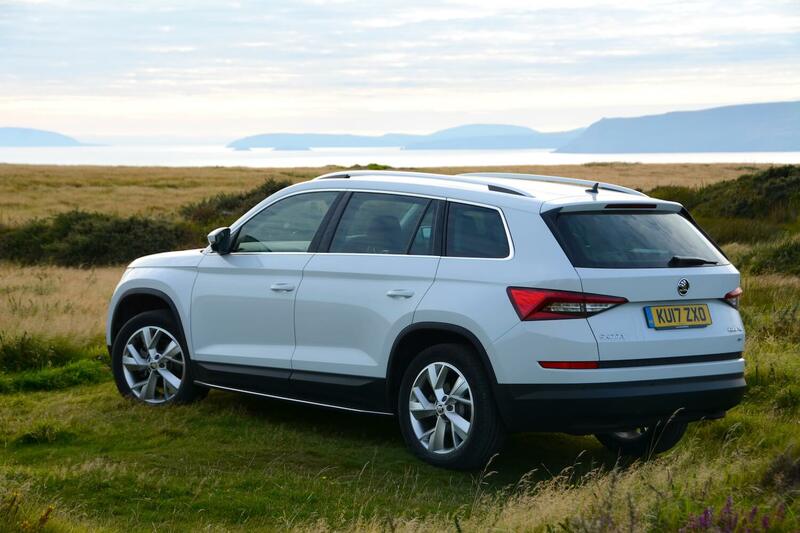 The cheapest seven-seat 4×4 model is the SE 1.4 TSI 150 PS 4×4, at £27,235. Trim levels are S, SE, SE L, Edition or Scout. The Kodiaq is available with petrol or diesel engines. Petrol options (ideal for predominantly local driving in built-up areas and low annual mileages) are the 125PS or 150PS 1.4-litre TSI or a 180PS 2.0-litre TSI. Diesel engines (most efficient for drivers undertaking long journeys/high mileages) come in 150PS or 190PS guises. Manual or DSG transmissions are available, and front-wheel drive or four-wheel drive. You can also opt for five or seven-seat versions (seven seats are only available on SE trim and above). So there really should be a Kodiaq for everyone. 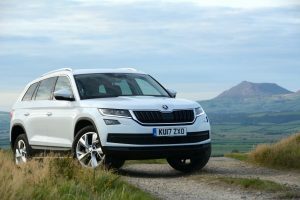 The Skoda Kodiaq Edition 2.0 TDI 150PS 4×4 DSG, as tested, is an excellent all-round car. 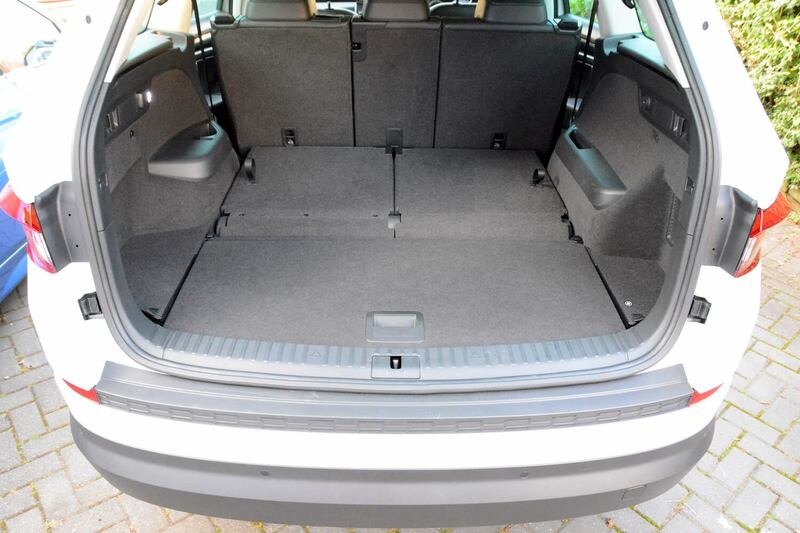 It has lots of space, either for five people plus a huge boot, or for seven people. 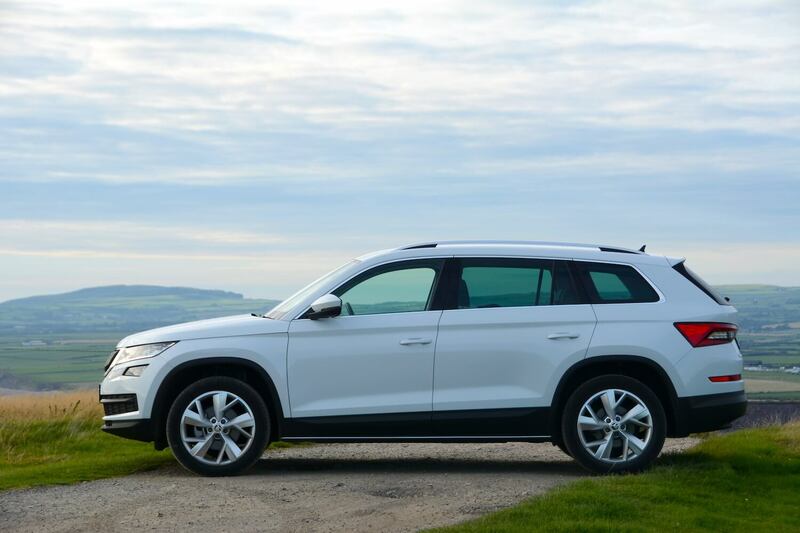 The 150PS 2.0 TDI engine delivers adequate performance for mixed driving, and is ideal for lots of motorway journeys, providing good economy for a seven-seater 4×4. The four-wheel drive system, combined with reasonable ground clearance, provides decent capability for adventures in the countryside, as well as in poor weather conditions. And all of this is available for a reasonably affordable price – £34,200 in the case of our test car – although a 4×4 seven-seater Kodiaq is available from £27,235 in the form of the SE 1.4 TSI 150 PS 4×4. 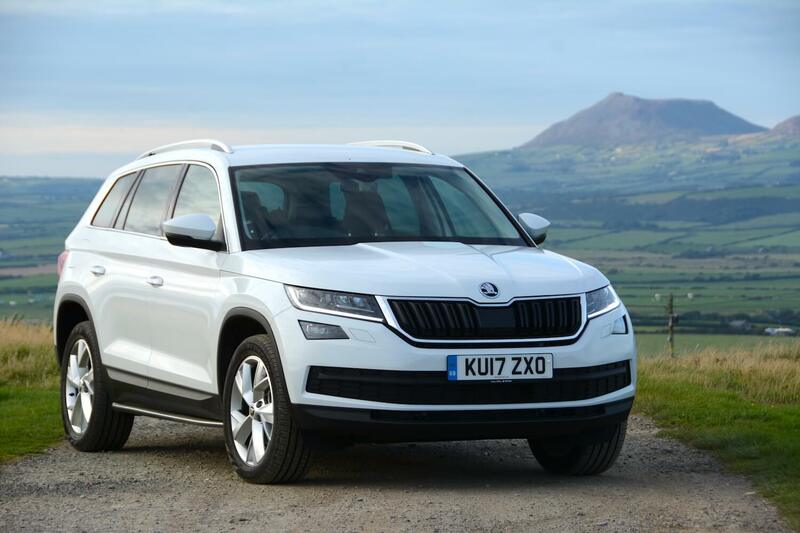 The Skoda Kodiaq gains a Green Car Guide rating of 8 out of 10.